A nuclear power plant shut down automatically as the worst outbreak of tornados to hit America for many years downed power lines in three southern states. Regional utility the Tennessee Valley Authority (TVA) reported blackouts in much of northern Mississippi as well as parts of northern Alabama and southeastern Tennessee as a result of the tornados and high winds. President Barack Obama declared a state of emergency in Alabama to allow the Federal Emergency Management Agency to coordinate relief efforts. Almost 300 people are reported to have been killed by the storms. TVA said it had never experienced anything like the passage of several storm systems through its 80,000 square mile service area. Each one caused more damage to transmission lines until over 100 transmission elements were knocked out and some 677,000 homes left without power. The three boiling water reactors at TVA's Browns Ferry nuclear power plant in Alabama shut down automatically with cooling systems powered by "a combination of offsite transmission and on-site diesel generators." However, the shutdown was notified as an 'unusual event' to the Nuclear Regulatory Commission "when the normal and alternate power supplies for essential equipment were unavailable for more than 15 minutes." 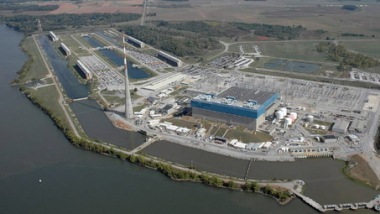 TVA stressed that "safety systems performed well." One 161 kV line is available to Browns Ferry, as are all the plant's eight diesel generators. One of these was out of service for maintenance when the storms hit, but work was completed quickly and the generator put back to work. No reports came from TVA on any storm effects at its other nuclear power plants, Sequoyah and Watts Bar.